The Hotel is situated in the Hill Cantonment of Kasauli, which is midway between the major cities of Chandigarh and Shimla. Alasia has a very chequered history and goes back to 1873, when the building was constructed and towards late 1930, this was used as banking establishment. In 1938, C.J. Tidwell purchased the property and was granted permission to convert the Bank into a Hotel on 4th November 1941. The Hotel was named `Alasia' in honour of Pearl Alasia, a shrewd businesswoman and a close associate of Tidwell. In 1949, Major and Mrs. Cosscrat, who operated the hotel until their return to England in 1960 purchased the `Alasia'. Major Robert Hotz and Mrs. Mary Hotz managed the Hotel from 1960 to 1966, when, finally they sold the hotel to what was then, Hotz Hotels Pvt. Ltd. (now Hotz Industries Limited). Alasia Hotel acquired reputation for excellence in warm hospitality. Its pastry shop and ice cream parlour too, were par excellence. In the last 1950's an ice cream cone at the hotel was priced at eight annas. In 1960 when the ownership was transferred to Hotz, the hotel became an important center for wining and dining. For the students studying in the Lawrence School (Sanawar), Alasia was a landmark place to visit. Till date, Sanawarians (Alumina) have very fond memories of this fine hotel and regularly revisit with nostalgia. The hotel also basked in the glory of the Theatre world and has to its credit a number of films shot in the hotel with cast like Shashi Kapoor, Jenifer Kendall and others. It also has hosted the Late Sir David Lean, the famous Hollywood Film Director (Lawrence of Arabia, Doctor Zhivago amongst others). Presently, the hotel has 13 Suites, which have been classified into Luxury Suites, Deluxe Suites and Family Suites. All Suites are tastefully designed, keeping in mind the comforts and needs of the present day guests. The Suites have attached baths, colour TV with DTH service, STD/ISD and newspaper facilities. Family Suite : This is ideal for a family and comprises of a large double bed and a daybed, which can be used as an extra bed for children. It has its own pantry for cooking and a separate sitting for panoramic views along with a verandah and a private garden. Luxury Suites : These are 2-Room suites. The front room is a large sitting room with a fireplace and a verandah, to view the mountains. Adjoining the sitting room is a large comfortable bedroom with attached bath and is equipped with all facilities. Both rooms are provided with TV. Deluxe Suites : These are 2 room suites. The Front room is a bedroom along with sitting facility and it overlooks the garden and the mountains. The second room serves as a dresser and also an area for an extra bed. The suites are ideal for family having children, so that children can play in the garden under the watchful eyes of the parents. Aesthetically located Spacious Rooms, Colour TV with DTH Service, Room Service, In-house laundry, Multi-cuisine Restaurant, Well stocked Bar, Sit out Balcony/Verandah in each Room, Card / Carom Room, Garden Cafe, Credit Card facilities, Parking Area, Doctor on call, Fax / Internet / e-mail facility , Travel Planning assistance, Big lawn for open parties , Born-fire. 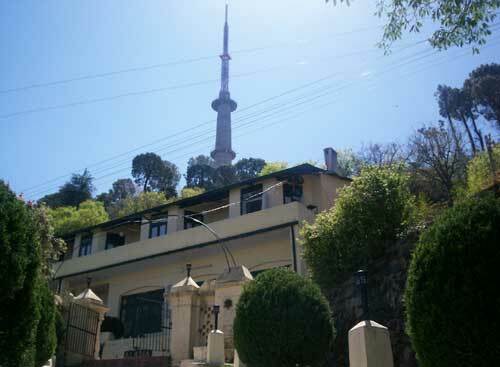 Kasauli provides visitors with a variety of options. For those who just want to relax, the long peaceful walks and visits to the local mall is quite enthralling. Whereas, for the more adventurous, the Manki Point, Lawrence School (Sanawar), Sabathu and other neighboring attractions serve as exciting getaways. Home to an age old temple dedicated to Lord Hanuman on top of a hill, and is also commanding a view of the surrounding area and offers a glimpse of the famous Himalayan peaks on a clear day. One of the oldest boarding schools in the country and founded by Sir Lawrence in 1847 as an asylum for the children of the Jawans. This is one of the most prestigious boarding schools in the country. Established as a reading room in the 1880's today the club is the Centre Point for people to spend their time. The Club boasts of a number facility, which includes tennis and squash courts, table tennis, snooker and badminton besides Bridge. The Protestant Christ Church, better known as the Church of England located on the Mall is a treat for the art lovers with its plush interiors and stained glass paintings. Baba Balaknath Temple and Shirdi Sai Baba Temple. Established on 3rd May, 1905 by Major David Semple as its first Director, the CRI is well known for its Anti Rabic Vaccine, Yellow Fever Vaccine, Bacterial Vaccines like Anti Cholera and Anti Typhoid Vaccine, Prophylactic and Therapeutic Vaccine (for four commonly known poisonous snakes). People from far and wide come here for treatment of snakebites, besides bridge. Upper Mall, Lower Mall, Sunrise Point, Sunset Point, Gilbert trail, Lover's Lane. Kasauli is located in the North Indian state of Himachal Pradesh and is connected via Rail to Kalka, or by Air to either Chandigarh or Shimla. It is situated just off the Chandigarh-Shimla highway with regular taxi service. The easiest way to get to Kasauli from the plains is via Indian Railways. The nearest Railway station is Kalka (38 km) and from there it takes around 1 hour by taxi to reach Kasauli. Alternately, one can take the small Mountain train from Kalka to Dharampur and use a taxi to reach Kasauli from there in around 30 minutes. This is a very pleasant option since the train passes through some scenic locations and goes through a number of tunnels. Kasauli can be reached by flying to either Chandigarh or Shimla. From the Chandigarh Airport, Kasauli is around 1 hour 30 minutes by taxi and from Shimla it is approximately 77 kilometers and it takes around 2 hours 15 minutes. Kasauli is around 310 kilometers from New Delhi. The journey from Delhi passes through Sonepat, Panipat, Ambala, Chandigarh and Kalka amongst others. It is an enjoyable drive taking upto 6 hours and going through some of the important towns of North India. From New Delhi - NH 1 to Ambala, NH 22 to Dharampur via Pinjore - Kalka - Parwanoo and Jabli. From Dharampur turn left for Garkhal (10 km) and proceed to Kasauli (4 km). Please Call us for the best travel deals Tele : +91 9810002772, 9910002772.